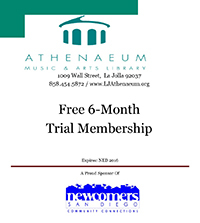 The Athenaeum Music & Arts Library is a non-profit membership library located in La Jolla, a community of San Diego. It was incorporated as the Library Association of La Jolla in 1899. It has a rich history, closely entwined with the history of the La Jolla community. 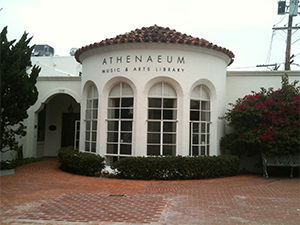 Located in the heart of La Jolla, California, in San Diego County, The Athenaeum is one of only 16 nonprofit membership libraries in the United States. This rare cultural institution, an important one to the greater San Diego area, offers a depth and accessibility of resources and programs found nowhere else in the region. The library, devoted exclusively to music and art, has an outstanding and ever-expanding collection of books, periodicals, reference material, compact discs, videocassettes, DVDs, sheet music, and librettos, as well as one of the most significant collections of artists’ books in Southern California. The library is open to the public five days a week; members can check out materials for a modest annual fee. Today the Athenaeum Music & Arts Library is a thriving cultural institution and one of only 16 membership libraries remaining in the U.S. The library welcomes 100,000 visitors a year and presents 150 programs that include concerts, exhibitions, lectures, and galas. It houses a unique collection of art and music books, CDs, DVDs, and special collections. It is recognized especially for its collection of artists’ books. The Athenaeum is housed in three historic buildings, which were joined and remodeled in 2006 following an ambitious capital campaign. It is headed by Joan & Irwin Jacobs Executive Director Erika Torri.